Jana Hockersmith is a Queer Latinx student at Boise State University. The pronouns Jana prefers are she/her. She is a communication major with an emphasis in relational and organizational communication. Jana is in her final semester at Boise State and will be graduating this May. 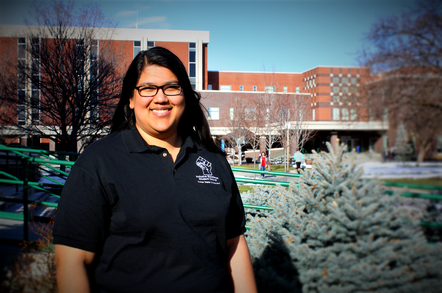 Outside of classes, she works on the Inclusive Excellence Student Council at Boise State. This Council, along with the Associated Students of Boise State University (ASBSU), exists to imagine and co-create a campus culture where all students may express their full humanity. The Council attempts to achieve this through creating equity in institutional changes and serving Boise State’s students, faculty, and staff members. After she leaves Boise State Jana wants to continue working for students within higher education. She plans to attend graduate school in the fall and hopefully earn her doctorate.